Pm or post here. Open to offers. pumpkin shoulder pad = 50c ea. Supreme iron knapsack 3 silver and rare adventurer hat 2 silver please CoD to fairyshine. I will offer 1.25 silver each for the picnic baskets (2.5 silver combined) and 30 copper each for all 12 Valentines (3.60 combined). If you want to accept any of those offers mail it to fairyshine as well. Thanks. Thanks Fairyshine. I sent the picnic baskets and rare hat. The knapsack was sold. [16:41:38] The items silently disappear from the spirit castle. You expect them to arrive in less than ten minutes. One of the pumpkin shoulders to Mordor please? I only found one during the event. [18:06:09] The items silently disappear from the spirit castle. You expect them to arrive in less than ten minutes. [09:25:53] The items silently disappear from the spirit castle. You expect them to arrive in less than ten minutes. 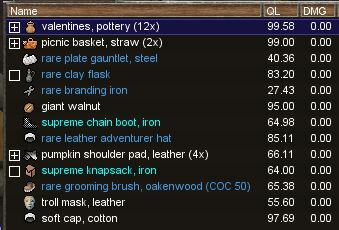 Hello can you please COD 2 of the valentines pottery = 50c each and the troll mask = 75c to Ordinii please. Any leftover Valentines Potteries to Ajblack please. Soft cap to Nordlys for 1s pls.